Disability expert Lisa Simmons shares empowering advice with families whose travel needs are extra special. Most parents will tell you that successful family traveling takes planning. Traveling with a special needs child takes even more preparation, but is sure to create wonderful families memories for everyone. Here are some tips to help make your adventure a true success. Many families with special needs kids are just plain scared of trips away from home. The thought of trying to do sensitive medical procedures “on the road” or deal with behavioral outbursts in front of a family crowd is simply too overwhelming to contemplate. Unless your doctor or specialist has specifically ruled out travel, don’t let your fears take over! Everyone needs to get away once in awhile and a little planning and preparation can put many of your fears to rest. Map out your trip and select destinations and rest stops that can accommodate your child’s needs. If you are planning a trip by car this will mean checking accessibility at your final destination as well as any places you’ll be stopping or staying en route. In addition to getting in the door safely, you’ll also want to consider what items you’ll need for bedtime, bathtime and mealtimes. By calling ahead you can bring along anything that your destinations don’t have. If any seem totally unable to meet your needs, don’t be shy about asking for other recommendations in the area. Maybe the knowledge that they lost a potential customer will inspire them to improve their accessibility. 3. Consult with Your Child’s Physician. A list of any prescription drugs your child is taking and a copy of each prescription. A physician’s description letter of your child’s condition and needs in case of an emergency. Phone numbers, e-mail addresses, and/or pager numbers of your home physicians/specialists. Recommendations for physicians and specialists in the area you’re visiting. Health insurance cards and phone numbers (be sure you’ve reviewed your insurance policy before you leave because many require prior approval before out of town emergency room or doctor’s visits). Phone numbers of any necessary medical supply company. Bring more than you need of the special items your child requires. Remember: “Better safe than sorry.” Well it goes double when you’re traveling. Don’t set yourself up for problems by running out of a critical item. Plus, with a few extras on hand, you won’t be rattled when a well-meaning family member accidentally drops or spills precious medicine! 5. Keep Track of Personal Essentials. If your special needs child has favorite toys, security items or essential medical items, you don’t want to discover them missing halfway home. As you pack, make a checklist of all essential items and double check it before you leave each stop of your journey. 6. Find Transportation to Meet Specific Needs. If your goal is to make your trip as stress-free as possible, this can be a critical choice. Is your destination close enough to travel by car? Would air or train travel put you too far from emergency medical personnel for an extended period? 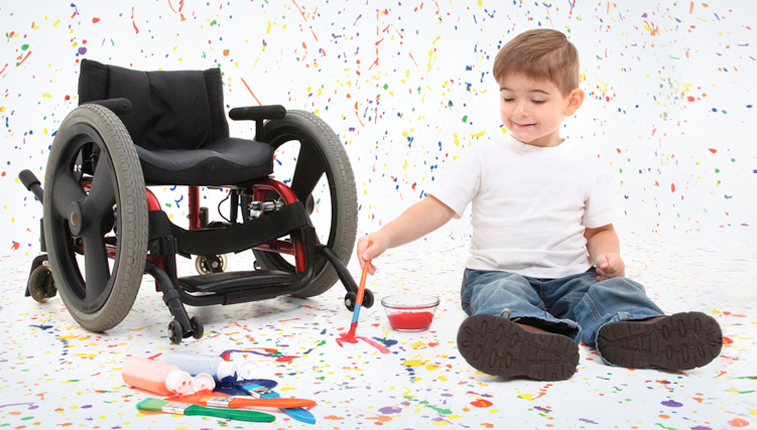 If your child requires specialized seating support, what type of travel works best with their seating system? If you’re working with a travel agent, be sure to ask about special guidelines or requirement for passengers with disabilities. An excellent source of detailed information about the logistics of planning accessible travel by plane, train, bus and ship is “Barrier-Free Travel: A Nuts and Bolts Guide for Wheelers and Slow Walkers” by Candy Harrington. During your travels you’re bound to run into individuals who don’t know what to do or how to react to an individual with special needs. As diplomatically as you can, let people know what you need and expect them to make accommodations for your child’s special needs. Most people will be more than happy to help. If they offer you a room or seating accommodation that just won’t work, politely decline and explain again what you need and why. Look at this as an opportunity to do your part for disability awareness! 8. Remember: It’s a “Family” Trip. If it’s your first trip away from home, you will naturally be concerned about how your special needs child is getting along, but don’t forget your other family members! Be sure you offer some quality time and attention to your other kids as well. While your special needs child is napping or occupied with a favorite toy, chat with other kids and reconnect. They will thank you by having a much more cooperative and supportive attitude when your attention has to be focused on your special needs child. 9. Plan a Day of Rest. Even the most experienced travelers experience jet lag and it’s not just confined to air travel! Expect both your kids’ and your own body to need some down time when you arrive at your destination, and again, when you arrive home. Allow a day for rest and recovery before you dive back into your hectic routine. Traveling, like everything else, is an acquired skill. If your first trip doesn’t turn out perfectly, don’t give up! Sit down and analyze what went wrong. How could you have prepared differently or more effectively? Which of your destinations and stopovers worked well? Which ones just need to be crossed off your list? Chances are, if your holiday trip was to visit family, you’ll be traveling that road again. Time spent establishing relationships can be time well invested! Just remember, every trip is a learning experience for you and a precious family memory for your children, whatever their needs! Safe travels! Lisa Simmons is a disability researcher and author of “The Internet Resource Guide for Parents and Disability Professionals”. Visit her online at Oklahoma Parents Center and learn more about the resources she provides to parents.